Captain America is my favorite super hero. It may sound corny, but I like how he can make a world full of grey seem black and white. Do the ends justify the means? No! Don't be an evil prick! Anyway, I was curious how others feel about Captain America, particularly those that aren't from the USA. What does Captain America represent to you? For me, he is the ideal that we can aspire to be, not just physically (he isn't technically "super powered," just the top human potential), but also morally. He represents the peak of our American democratic experiment, that we have yet to live up to, but Cap is hoping we can achieve. Freedom, equality, defend the weak; these are all things I can really get behind. 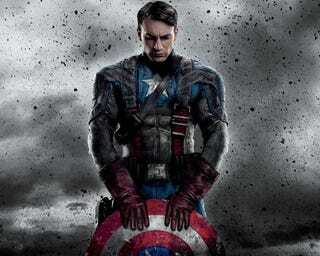 Though I think most Americans, no matter what political persuasion, feel ownership of Captain America. Also, women and POCs, do you feel Cap represents you? I care a lot about this character but I won't be offended by any answer.